For our brief video introduction to the Manufacturing industry, see www.plunkettresearch.com/video/manufacturing . The first industrial robot to be installed in a major manufacturing plant was probably a machine named Unimate #0001, utilized at a General Motors diecasting plant in Trenton, NJ beginning in 1959. The primary force behind the Unimate was an American named Joseph Engelberger (sometimes referred to as the “father of robotics”) of the Consolidated Controls Corp. of Bethel, CT. These efforts led to the establishment of a related firm, Unimation, Inc. By the late 1960s, automobile manufacturers were racing to install robotic units such as automated welders in their plants worldwide. As the decades went by, Japanese and German firms grew to be world leaders in factory automation equipment and robotics. This trend was directly tied to the growing dominance of Japanese and German automobiles, and the decline of the American auto industry. Meanwhile, China has official hopes to be a world leader in factory automation technologies by 2025, and it is investing accordingly under its “Made in China 2025” plan. America is attempting to improve its global stance in industrial robotics and automation through the establishment of “Advanced Robotics Manufacturing Innovation” centers, which have attracted backing from both government and corporate funds. 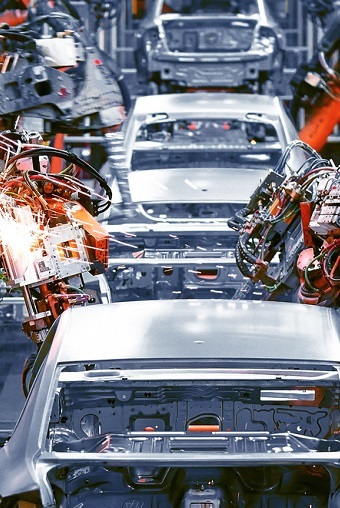 The ever-growing drive for efficiency and quality, both at the factory and in the supply chain, will make automation technologies more and more vital. Robotics and automation assist manufacturing in a wide variety of ways, far beyond final assembly. 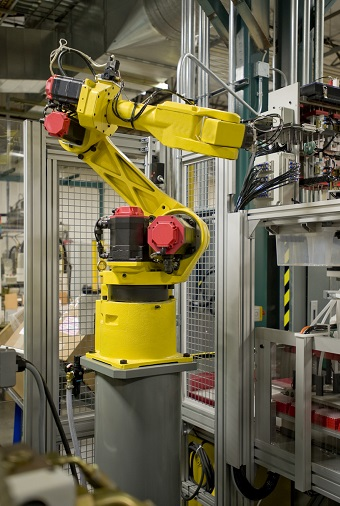 Robots can control the warehouse, delivering parts to the factory floor on an as-needed basis. Computers and sophisticated software help to design, model and test products prior to their actual manufacture, and then upload final instructions to computer-driven factory equipment. The design of components and sub-assemblies are, to a dominant degree, conducted through computer-aided design tools (often called CAD-CAM) that can be tightly coordinated with the factory floor. Global Manufacturing: The worldwide manufacturing sector is estimated by Plunkett Research at $12.8 trillion (in terms of value added) for 2018. In 2012, analysts at McKinsey & Co. estimated that manufacturing accounted for 16% of global GDP and 14% of global employment. The firm further estimated that manufactured goods currently make up 70% of all global trade, and that manufacturing’s impact on service industries is so great that manufacturers purchase 19 cents of services for every $1 of manufacturing output. Those numbers should remain reasonably accurate for 2018. Manufacturing Revenues and Employment in the United States: In the U.S., analysts, executives and government can clearly see that manufacturing is on the upswing. A bigger question, however, is whether or not American manufacturing is perhaps entering a period of renaissance. The answer is both yes and no. Manufacturing employment in America has increased modestly in recent years, including growth of about 327,000 during the 12 months ending in July 2018. There were approximately 12.8 million people employed in manufacturing in the U.S. as of mid-2018, down from 19 million in 1980. Much of manufacturing’s recent rebound has been driven by large improvements in the automobile sector, along with relatively strong demand for building materials and medical equipment/supplies. The American manufacturing sector will benefit over the long term from a broad range of trends, including strong global trade, low natural gas prices, a growing domestic population, and strength in certain key industries, including machinery, pharmaceuticals, health technology, chemicals, petroleum products, aerospace and equipment for transportation and construction. However, advances in factory productivity, including growing investment in robotics, will dampen job creation. In other words, factory output can increase faster than factory employment due to growing investment in robotics and factory automation. Improved supply chain practices will also enable manufacturing to boost output faster than growth in factory jobs. The American manufacturing sector will generate about $2.2 trillion in value added during 2018, equaling about 11.6% of GDP. This is down from 20% of GDP in 1980. In manufacturing, value added is the increase in the price (value) that a company adds during the manufacturing process. For example, a window manufacturer may purchase sheets of glass, raw aluminum, plastics and paints from its suppliers. It fabricates and combines these materials to create a finished window. The value added is the difference between the cost of the raw materials and the price of the finished window. Value added is a common measure of manufacturing output. Today, the growing use of robotics as well as the rising wages and other costs in offshore manufacturing centers, particularly China, is fueling intense debate about the future of global manufacturing in general. Supply chain managers on the corporate side, along with analysts and planners on the government and economic side, are attempting to develop strategies for dealing with the evolving manufacturing segment on a nation-by-nation basis. To begin with, costs are clearly rising substantially in China, which has long been the world’s manufacturing growth engine. Wages there have been rising steadily, over a period of several years. At the same time, demographic changes are having a significant effect. Due to China’s lengthy history of “one child per family” regulations, the Chinese workforce began shrinking in number in 2011, while the senior segment of the population is growing at a rapid clip. Put another way, China is facing a massive aging problem (far more challenging than the aging population in the U.S.), while the number of young workers available to fill the factory ranks is tipping into serious decline. Due to the development of a large network of universities across China, a growing percentage of young people are obtaining college degrees. These better-educated people, upon entering the workforce, generally do not want to work on the manufacturing floor, which they feel is beneath them. These trends are having multiple effects on manufacturers in China. 1) As discussed above, firms are paying much higher wages than they did in the recent past; 2) There is a national emphasis on increased investment in robotics and more to factory automation, in order to reduce China’s reliance on human workers; 3) The bigger companies are becoming more multinational in nature, moving much of their basic manufacturing to lower-wage nations such as Vietnam and Bangladesh; and 4) Chinese manufacturers are moving up-market, where the manufacture of technically-advanced products such as aircraft creates the ability to pay higher wages while taking advantage of the growing cadre of engineers who are graduating from China’s universities. The Chinese government has an official strategy, designated “Made in China 2025,” of boosting investment in high-value technology-based manufacturing industries, including aerospace, semiconductors, automobiles, pharmaceuticals and robotics. While China struggles to adapt to its changing costs and demographics, manufacturing has been booming in many lesser developed nations that offer lower costs for real estate and hourly wages. Such nations are found in Asia, including The Philippines, Laos, Cambodia, Pakistan, Bangladesh and Vietnam. However, Africa is likely to become one of the world’s basic manufacturing hubs for unsophisticated items such as apparel. Africa offers an abundance of raw materials, one of the world’s largest supplies of young workers, a rapidly growing population, a growing transportation infrastructure well positioned to serve markets in Europe, Asia and the Americas, as well as extremely low costs. In Asia’s more developed nations, particularly Thailand, Taiwan, Korea, and Singapore, manufacturing of high value items has grown at a soaring rate over the long-term, including automobiles, electronics and pharmaceuticals. India is often thought of as a center for business processes outsourcing, but it also has a significant and growing manufacturing base. To a large extent, this manufacturing is in heavy industries, such as steel and petroleum products. 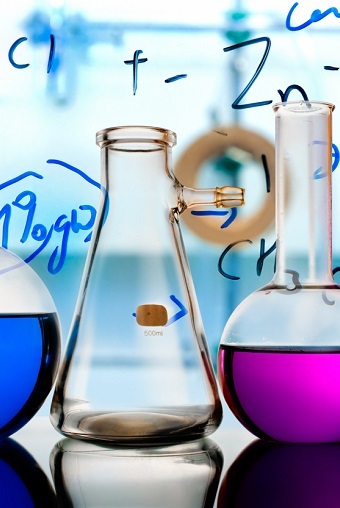 However, the manufacture of sophisticated products, such as pharmaceuticals, has become significant. One of the biggest beneficiaries of China’s rising costs is Mexico. Mexico’s manufacturing sector has been perfectly positioned to grow, thanks to a) its proximity to U.S. markets; b) NAFTA—the North American Free Trade Agreement; c) existing low-cost transportation infrastructure for shipments to and from the U.S.; and d) the relative ease of doing business between U.S. and Mexican companies. Mexico is positioned perfectly to grow with the recent trends of reshoring and nearshoring, where many U.S. companies want their manufacturing plants and suppliers to be closer to home. Recently, the Mexican manufacturing sector has also been boosted by the availability of shale natural gas that can be imported from the U.S. at low prices. Gas exports from the U.S. to Mexico increased dramatically along with rising gas production from American shale wells. The Trump administration vowed to focus on renegotiating NAFTA, with the hope of making it more beneficial to American businesses. Robotics and Factory Automation: The International Federation of Robotics (IFR) estimated the total, worldwide base of operational industrial robots at the end of 2016 was about 1.8 million, and this base will expand to approximately 3.1 million by the end of 2020. The global sales of industrial robots during 2017 was placed by IFR at 380 thousand units.